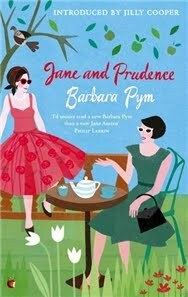 Barbara Pym’s 1953 novel Jane and Prudence tells the story of two friends, Jane Cleveland and Prudence Bates. In the opening scene we’re told that Prudence “was twenty-nine, an age that is often rather desperate for a woman who has not yet married”, whereas Jane “was forty-one, an age that may bring with it compensations unexpected by the anxious woman of twenty-nine”. The two women became friends at Oxford, where Jane was Prudence’s tutor, and then went on to follow very different paths in life. Jane is a vicar’s wife who always feels she’s performing her duties inadequately; when the novel opens, she and her family are about to move to a small country parish, and Jane wonders if her life will become like something out of a Trollope novel. Prudence, on the other hand, is a single young professional woman living in London, where she enjoys love affairs that would scandalise her friend’s small community. When Jane meets a seemingly eligible widower, she decides to try her hand at matchmaking, and what follows has slight echoes of Emma both in the process and in the results. Jane and Prudence is a satirical look at the frugal post-war world of continued food rationing and rigid social distinctions. The novel is a sharp comedy of manners, but there’s an undercurrent of… perhaps not exactly sadness, but certainly darkness underneath it all. Pym’s main focus is on women’s lives and on the limitations of the roles available to them in the 1950’s. She’s brilliant at capturing the intricacies of social life and all the nuances and implications of everyday social exchanges, and at conjuring a whole community with just a few colourful details. Comparisons to Jane Austen always seem to make an appearance in reviews of Barbara Pym’s novels, and there’s a very good reason for that. Despite the darkness I alluded to (or, more accurately, along with), Barbara Pym’s sense of humour is absolutely fantastic. Her portrayal of the social conventions and norms most of her characters accept and take for granted is so funny that the reader can’t help but see them in their full absurdity. The result, of course, is an elegant form of social critique. Mrs Crampton brought the soup, which they finished, and there was a long silence. Neither Jane nor Nicholas spoke and nobody came into the café. After a time Jane heard sounds from behind the velvet curtain, the low mumblings of voices and the hiss of frying. At last Mrs Crampton emerged from behind the velvet curtain carrying two plates on a tray. She put in front of Jane a plate containing an egg, a rasher of bacon and some fried potatoes cut in fancy shapes, and in front of Nicholas a plate with two eggs and rather more potatoes. ‘Oh, a man needs eggs!’ said Mrs Crampton, also looking pleased. This insistence on a man’s need amused Jane. Men needed meat and eggs – well, yes, that might be allowed; but surely not more than women did? Perhaps Mrs Crampton’s widowhood had something to do with it; possibly she made up for having no man to feed at home by ministering to the needs of those who frequented her café. Nicholas accepted his two eggs and bacon and the implication that his needs were more important than his wife’s with a certain amount of complacency, Jane thought. But then as a clergyman he had had to get used to accepting flattery and gifts gracefully. Mrs Crampton now returned and set down before Mr Oliver a plate laden with roast chicken and all the proper accompaniments. He accepted it with quite as much complacency as Nicholas had accepted his eggs and bacon and began to eat. Jane turned away, to save his embarrassment. Man needs bird, she thought. Just the very best, that is what man needs. “A man needs eggs” and “a man needs meat” go on to become recurring joke throughout the rest of the novel – jokes that perfectly exemplifies the way the Pym balances humour with darker undercurrents. The scenes in which several characters say this with a perfectly straight face are hilarious, but the implications of second class status for Jane and other women are very much not. One of the things I appreciated the most about Jane and Prudence was the fact that it portrayed both the single, independent woman and the married one as having their troubles and their sources of contentment. No single life path was glorified or shown to be the miraculous solution to women’s problems, and no life path was reviled. Instead, Jane and Prudence’s choices are validated but shown in their full complexity, and both stories draw attention to how much social structures still needed to change before these women could find satisfying ways out of their particular difficulties. I find this approach somewhat rare even today, let alone in 1953. This was my first Barbara Pym novel, but I can’t wait to read her again. I must pick up Excellent Women soon. Flora went quietly from the room and Nicholas came in, rubbing his hands together and looking vaguely benevolent. They brooded silently for a moment over this horror. There are times when only a Pym novel will do - so glad you had a chance to read her! Excellent Women was just as good and I also enjoyed Quartet in Autumn. Next up for me will be Some Tame Gazelle... it's Thomas' (My Porch) favorite. I'm glad you enjoyed it, and I completely agree with you about her eye for absurd social conventions and gender roles. I really like that her women sometimes choose to be single (usually rejecting a few awkward marriage proposals along the way!) and the single women aren't seen as somehow lacking or less interesting characters than the married ones, even though they may have their regrets. I love the quotation of the scene in the cafe - I think some people still think like that today! Have Excellent Women on the wish0-list for ages. She seems exactly my cup of tea. I would expect more similarities with EM Delafield than Austen... interesting! I think I have only read one Barbara Pym book, and while I enjoyed it, I think I would enjoy this one a lot more. It sounds as if Pym has her head on straight about certain things. I will be looking forward to this one! So glad you enjoyed your first Pym! I've not read this one but I have it on a shelf along with a couple other unread Pyms. I parcel them out so I don't read through them all in a big binge. It's been a little over a year since my last Pym, I'm starting to think it's about time for another one. Sign me up! On to the tbr this goes. I'm ready for more Pym. Sigh - my TBR pile keeps growing and growing. Thank you for this review! I'd never heard of Pym before, but she sounds awesome. Glad you liked J&P. I went on a Pym binge and read all her novels I could find, plus an autobiography, which put the novels into context. Some Tame Gazelle is perhaps her most bleak book, from memory. She always writes about similar themes, but there is that undercurrent of melancholy, which I found unsettling at times. She was a wonderful writer, though. I love Barbara Pym and have read all her novels, some several times. J & P is a favourite of mine, as well as Excellent Women and Less Than Angels which does a brilliant job of satirising academia. Lovely review, Nymeth! I love, love, love Barbara Pym. I discovered her through the wonderful Pickle Me This book blog a couple of years ago and read all of her books. Excellent Women is fantastic. I also wanted to thank you for recommending Eva Ibbotsen. I took a few of her books on my last vacation and thoroughly enjoyed them. Can't wait to read more. I've read one Barbara Pym novel, quite a long time ago - and I don't remember which one it was! But I do remember enjoying it very much, and wanting to read more. Thanks for reminding me of her. I'm going to be adding Pym to my TBR this year. I've never heard of Barbara Pym before, but now I want to check her out. Haven't read any books by Barbara Pym yet but Excellent Women is on my list to read this year hopefully. I love the excerpts you included. Also, some guy's name is Manifold? I feel rather sorry for that character. I haven't read any Pym yet. This sounds like just the thing, especially with the echoes of Jane Austen through it! Lovely review, Ana. I really enjoyed how you talked about women's roles, how socially narrow they were in so little as 60 years ago, how little choice women had then. Yes, this books sounds very good. This is a wonderful, wonderful review. I so loved Jane and Prudence. Sometimes I think of sitting down and reading all the BP books one after another. Sounds like bliss to me. I wrote about Jane and Prudence five years ago. I can hardly believe that much time has gone by. It seems like I read it last week. I've had this on my list for ages! I am completely addicted to books about the role of women, as well as social history of any kind. I was absolutely obsessed with Pym last year. I highly recommend that you read ALL of her novels, since they are all rather short and so few in total. Some are better than others, but every one so enjoyable in subtly different way like piano sonatas. Although each novel is a stand-alone, some characters make cameo appearances, and you will be glad to know of their fate.